Bonucci was sent off in the first half of Milan's 0-0 draw at home with Genoa on Sunday for elbowing a defender in the head as he jostled for position on a free kick. 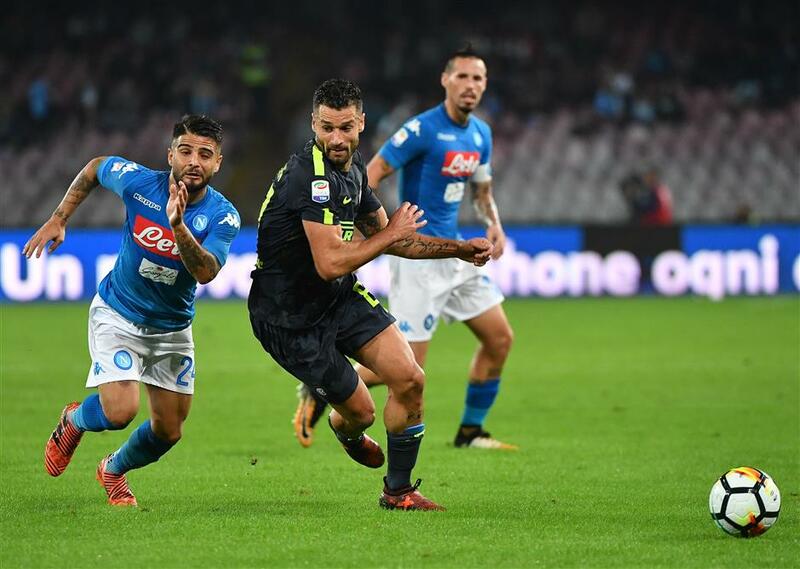 Napoli striker Lorenzo Insigne (left) fights for the ball with Inter Milan midfielder Antonio Candreva during their 0-0 Italian Serie A draw at San Paolo stadium in Naples on October 21, 2017. Leonardo Bonucci's latest lapse in concentration may end up costing Vincenzo Montella his job at big-spending AC Milan. Milan lost its three previous Serie A matches and was also held 0-0 at home with AEK Athens in the Europa League on Thursday. Last weekend, the Rossoneri lost 2-3 to Inter Milan in the city derby after Bonucci was beaten by Mauro Icardi for Inter's opener. Montella has been under pressure for weeks. Milan, which was bought by a Chinese-led consortium in April, spent more than 200 million euros (US$250 million) on new players in the offseason and Bonucci was the centerpiece of the overhaul. The fee for Bonucci's surprise move from Juventus topped 40 million euros, and he signed a five-year contract worth up to 10 million euros per season — making him the highest-paid player in Italy. But Bonucci has been off form over the last month and now risks missing the game against Juventus next Sunday if he's given a two-match ban. Bonucci's blow to Aleandro Rosi's head in the 23rd minute left the Genoa player on the ground for several minutes before the blood was cleaned up and he continued playing. The referee did not initially show Bonucci a red card. The decision came with the help of the video assistant referee (VAR) — marking the first time a red card was handed out by the VAR in Italy. Things could have gotten worse for Milan when Genoa's Andrea Bertolacci — who is on loan from the Rossoneri — narrowly missed a dangerous effort after the break. Nikola Kalinic, another of Milan's signings, missed several chances at a late winner. Milan dropped to 11th place, 12 points behind leader Napoli. Elsewhere, Aleksandar Kolarov followed up his midweek goal against Chelsea by scoring from a free kick in AS Roma's 1-0 win at Torino. The Serbian became the first player to score two goals from direct free kicks in Serie A this season, having also connected on his Roma debut in August against Atalanta. Stretching back to last season, it was Roma's 11th straight away win, matching the Serie A record. Roma is fifth, one point behind Juventus and Lazio. Six-time defending champion Juventus was visiting Udinese later on Sunday aiming to end a two-match winless streak and fourth-placed Lazio was hosting Cagliari. Roberto Inglese bolstered his case for a January move to Serie A leader Napoli with a brace in the Verona derby, helping Chievo to a 3-2 win on Sunday. Napoli purchased Inglese's rights in August but left the striker on loan at Chievo. However, since Arkadiusz Milik was lost to a long-term injury in September — his second such injury in two seasons — Napoli has expressed interest in moving up Inglese's arrival to January and loaning Milik to Chievo in exchange so the Poland international can regain his form once he's fit. Substitute Sergio Pellissier got the winner for Chievo, which moved up to seventh place. In other matches on Sunday, it was: Atalanta 1, Bologna 0; Benevento 0, Fiorentina 3; and Spal 0, Sassuolo 1. Benevento became the first team in Serie A history to lose each of its first nine matches of the season. Napoli and Inter drew 0-0 on Saturday.